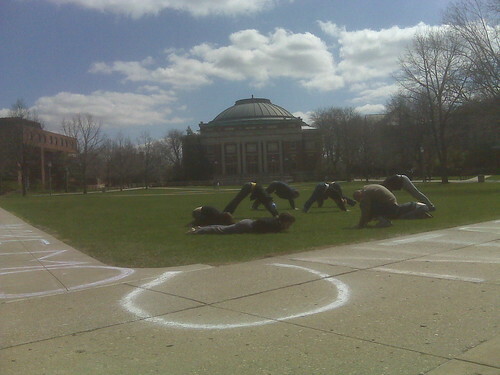 Last Friday I made it to the U of I quad during an event by local artist Bonnie Fortune called Make Mountains. Participants were instructed to assume a stance similar to downward facing dog. I participated as long as my wrists would let me, and then went on my way after snapping this photo. We don’t have any mountains here, and the flat land seems boring and barren sometimes. This performance gesture was a nod to those communities suffering from mountaintop removal practices. Thanks for participating ! That was a lot of fun…stay tuned for more exciting geological performances.